If you work with documents on multiple devices, we recommend you sync your files to access them anywhere. Sync is especially helpful when you do a lot of PDF editing and annotating. If you're a student, you can use an iPad to annotate your textbook in class and continue studying on your Mac at home. Your notes from iPad are already here! No need to do the same job twice. We created PDF Expert to make working with PDFs fun and pleasant on Mac, iPhone, and iPad. If you have PDF Expert on multiple devices, you can easily sync your files and annotations. Here are the ways to do it. 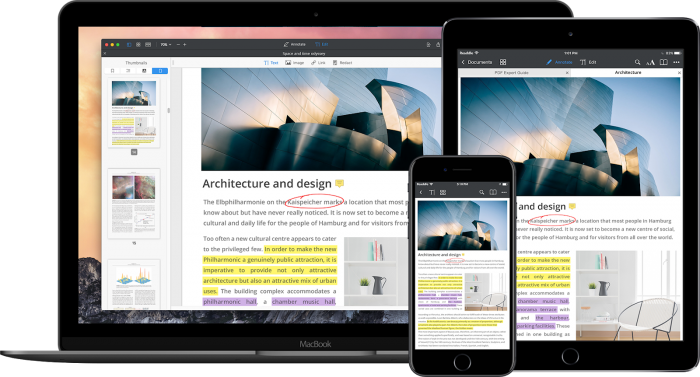 You can start annotating a PDF document on your Mac and pick it up right where you left it on your iPad or iPhone and vice versa. For example, you can edit a contract on your Mac and instantly open this document on iPad to sign it with the Apple Pencil. 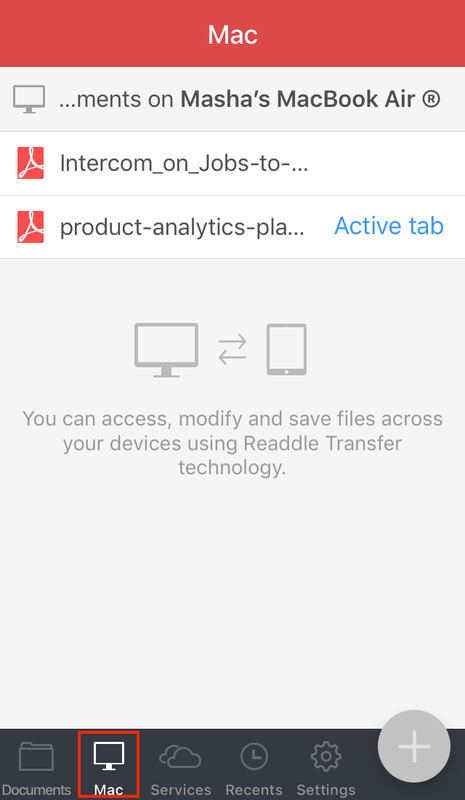 It's easy with Readdle Transfer! Work with your files anywhere you wish, and PDF Expert saves changes across your devices. PDF Expert runs on both devices. Your devices are connected to the same Wi-Fi network. You are signed into the same Apple ID on both your devices. iCloud is enabled on both your Mac and iOS device. Open your file in PDF Expert for Mac and start working on it. Launch PDF Expert on your iPhone or iPad and open the Mac tab. Here, you can see the files opened on your Mac. Choose the PDF you need. Voila! Your file opens just where you left it on your Mac. When you change the file on your iPhone or iPad, PDF Expert asks if you want to update the document on your Mac. Click Reload in a pop-up window. If the file was modified on Mac, tap Reload on your iPhone or iPad to save the latest version. 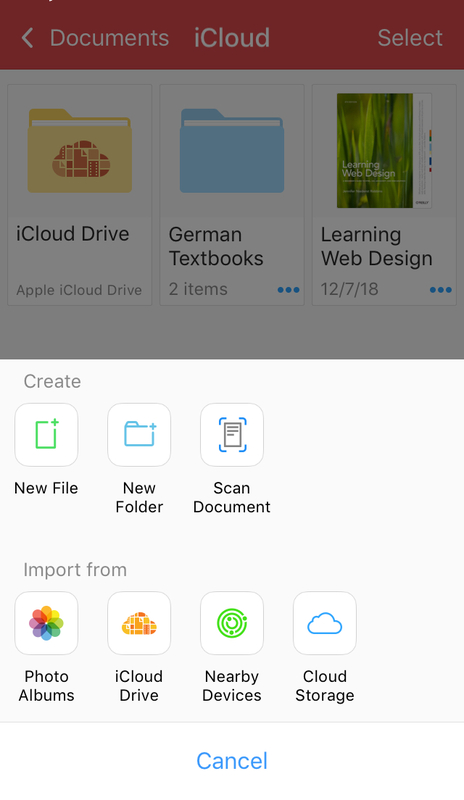 When you close the file on your iPhone or iPad and there are unsynced changes, you can choose where to save the PDF: back to your Mac or as a separate copy on your iOS device. 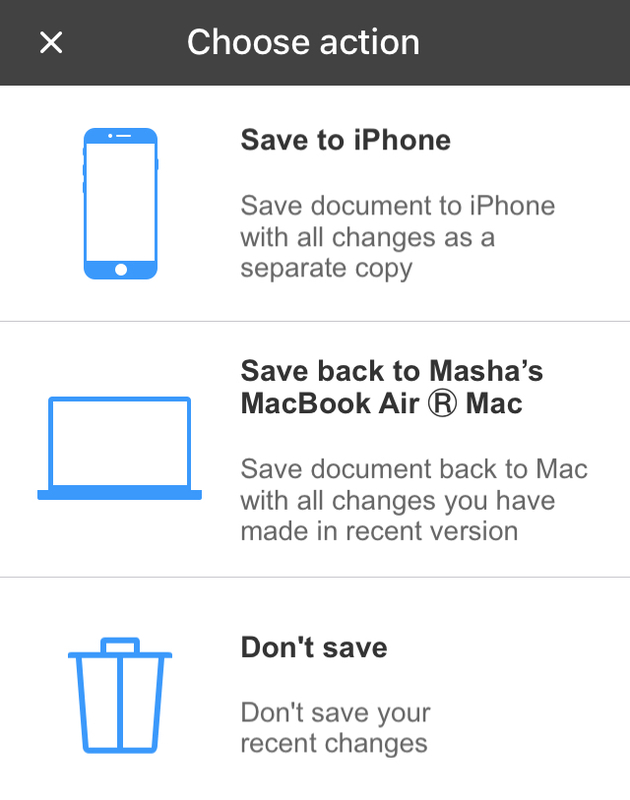 Note: The copy of the file from your Mac isn't saved on your iOS device automatically. If you want to save it, tap … at the top right and select Save Copy. 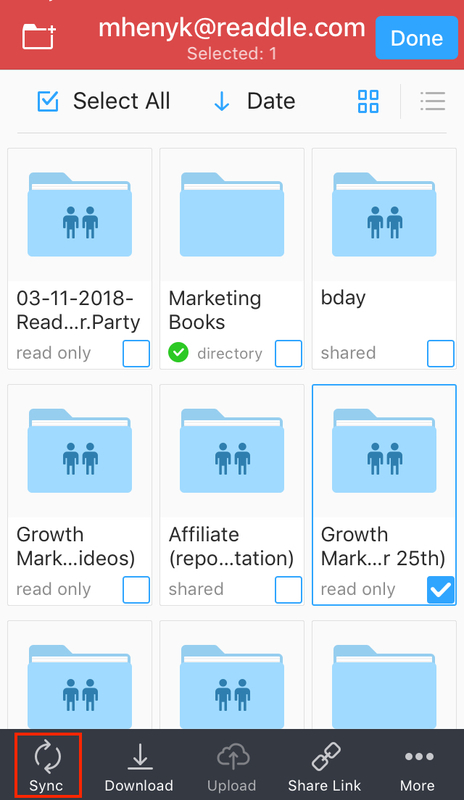 However, you don't need to save the file manually if it's located in a folder synced with iCloud or a different cloud storage on both your devices. Open a document in PDF Expert for iOS and start working on it. Launch PDF Expert on your Mac. Click on the blue button at the top and select the file from your iPhone or iPad. Your document opens right where left it on your iOS device! When you modify the file on your Mac, PDF Expert on your iPhone or iPad asks to update it and vice versa. Press Reload to keep the latest version. When you close the document on Mac and there are unsynced changes, PDF Expert asks where to save this file: on your Mac or back to your iOS device. Note: The copy of the PDF file from your iOS device isn't created on your Mac automatically. To have this file on your Mac, click File > Save > Save to Mac. 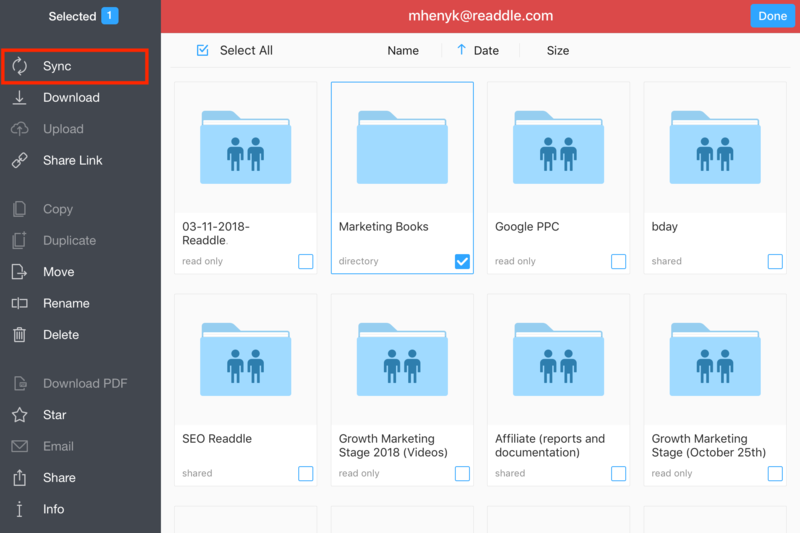 Yet your file is saved and updated automatically if it's located in the folder synced with iCloud or a different cloud storage on both devices. There are more options to move files between your Apple devices or PC. Check our article "How to transfer PDFs from Mac/PC to iPhone/iPad and Vice Versa" for a detailed guide. Using iCloud is the most natural way to sync files across Apple devices. Make sure you are signed into the same Apple ID on both your Mac and iOS device and the iCloud Drive is enabled. On your Mac, open System Preferences > iCloud > tick iCloud Drive. On your iOS device, open Settings > [your name] > iCloud > enable the iCloud Drive toggle. Let's try to sync some PDFs! After launching PDF Expert on your iPhone or iPad, you'll see a new folder called PDF Expert or Documents by Readdle in your iCloud. Move the PDF files and folders here to access them on all your devices. Open the iCloud tab in Finder. 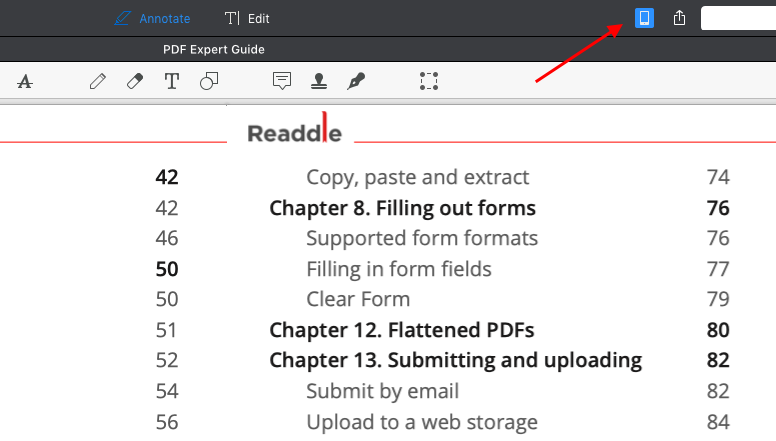 Drag & drop PDF files or folders to the PDF Expert or Documents by Readdle folder. That's all! You're completely backed up. 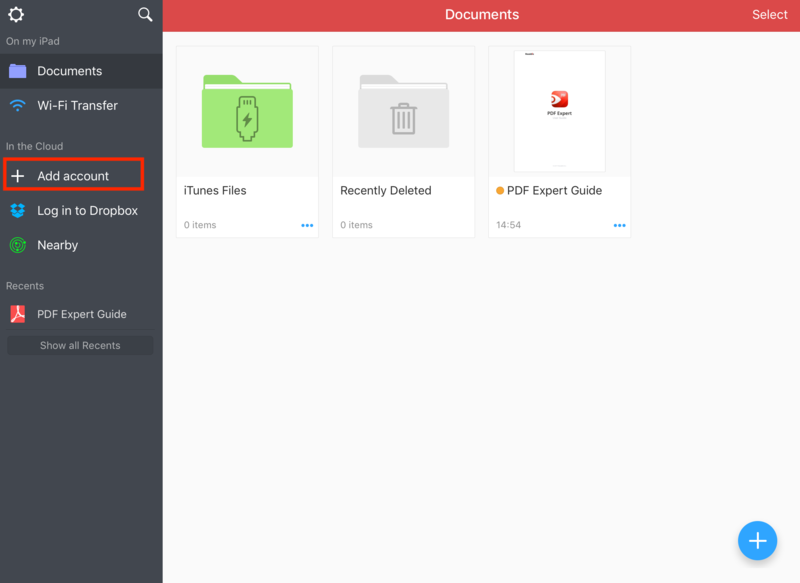 Launch PDF Expert and open the iCloud folder on iPhone or the iCloud tab on iPad. Tap the blue plus icon at the bottom right and choose where to import the files from. Tap the needed file and it uploads to iCloud. 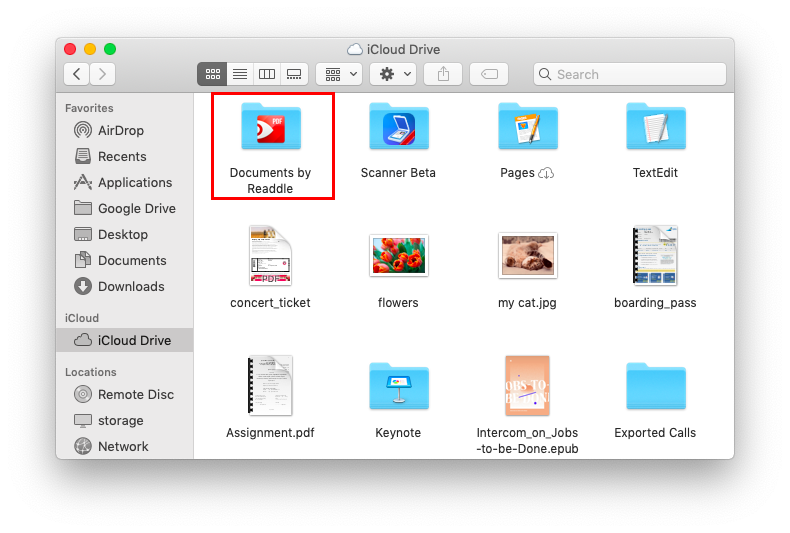 You can also drag & drop an existing file to the iCloud folder in PDF Expert. PDF Expert for iOS works with all main cloud storages including Dropbox, Google Drive, Box, and OneDrive. You can sync a selected cloud storage folders with PDF Expert to keep your files and annotations up to date. 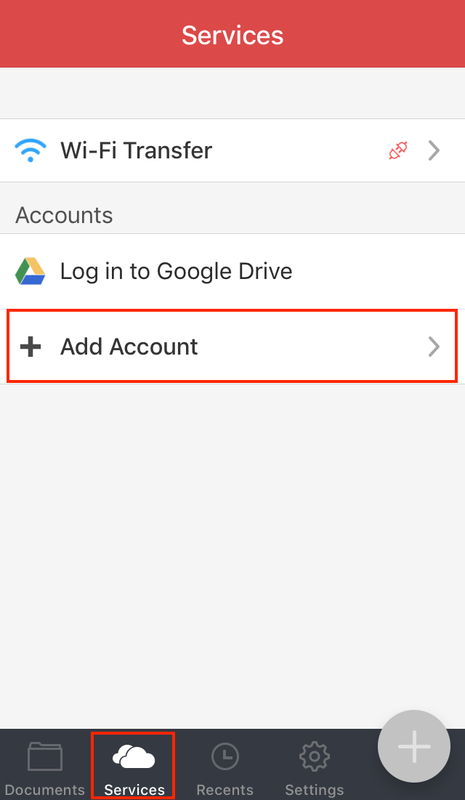 Tap your account on the sidebar or choose + Add account to connect to cloud storage. Choose cloud storage from the list and follow the onscreen instructions to log in. Tap Select at the upper-right corner and choose the folders you want to sync. Tap Sync on the sidebar. You can find this folder in the Synced folders tab on the sidebar. Edit files from this folder in PDF Expert and all changes sync with a cloud. Open the Services tab in PDF Expert. Choose an existing account or tap + Add account to connect to cloud storage. Select the needed cloud storage and follow the onscreen instructions to sign in. Tap Select at the top right and choose the folders you want to sync. Tap Sync at the bottom left. Now, you can access this folder in the Synced folders folder in PDF Expert. All edits are synced with the cloud. Note: You can also edit a PDF file directly in cloud storage, without syncing a specific folder. Just connect to your cloud storage in PDF Expert on your iOS device and open the needed file. All changes you make sync with a cloud. You can edit a file in PDF Expert for Mac and sync changes with a cloud. All you need is a desktop cloud storage app. For example, after downloading the Google Drive app, you can go to the Google Drive tab in Finder and open the needed file in PDF Expert. The changes will sync with PDF Expert on your iOS device if you have synced this folder here. We've described three ways to sync PDF files and annotations across your devices. It's time to find out which one works the best for you! Download PDF Expert for Mac, iPhone, and iPad if you haven't done so already.